The Nintendo Switch is a tiny console with tiny controllers all powered by tiny batteries with tiny capacities. Charging is just part of life with the Switch, which is why it’s spawned hundreds of power accessories, including this portable battery that looks like the most boring Switch game you can play. But while Bionik’s Power Plate looks like a smaller version of the console, with only half a screen, it’s actually a 4,500 mAh rechargeable battery with a built-in black and white LCD display showing what devices are currently being charged. 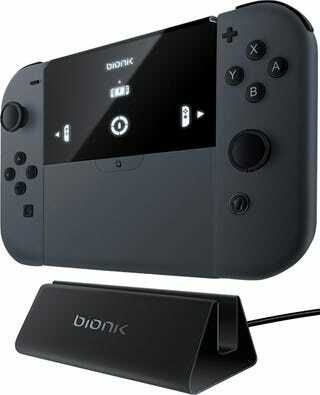 The Switch’s Joy-Con controllers can attach to either side of the Power Plate and be recharged three times over, letting you continue to play games with them while the console is connected to a TV. Or you can connect the Switch itself to the Power Plate via a USB-C cable and top off its own internal battery, but just once, given how power hungry the portable console is.